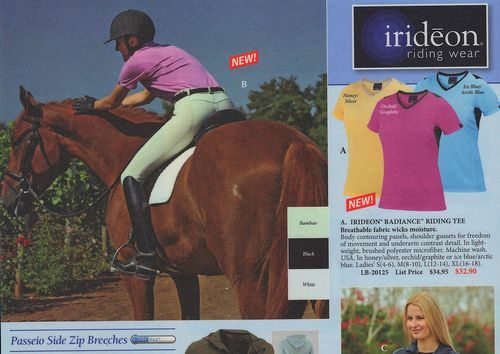 The Passeio breech as modeled by Molly Knott and Abercrombie (Fitch) in the Dover catalog. In response to a frequently asked question: What brand of breeches do you wear? “During a photo shoot for Irideon Riding Wear, I was asked to wear a pair of their newly developed breeches, ‘The Passeio.’ When I first saw them on the hanger, I thought ‘There is no way these are going to fit MY body.’ But when I actually slipped them on, I felt absolute comfort! Of course, there were two more tests to come: first, a glance in the mirror and second, how will they feel and perform in the saddle? Again to my surprise, I took one look and loved the lower-waisted style and, even better, the side zip. My legs felt free and not restricted like my expensive German imports. When it came time to sit in the saddle, I really expected to feel the seams, as I had tried similar styles in other brands. But the Passeios passed the final test with flying colors! I nearly felt guilty because I was so comfortable and it was such an easy fix to feeling better in the saddle. Who would have thought? !